Items from our archives including the records of local and community organisations and clubs, church archives, genealogical records, business archives, original diaries and manuscripts, as well as the papers of individuals. Booklet compiled in 1935 which includes notes on inhabitants of Governors Bay, photographs and a souvenir booklet celebrating the 75th anniversary of St. Cuthbert’s Church. A small collection of material, published and unpublished, relating to World War 1, collected by Oswald Norris and his family. Oswald Mark Norris served in the Canterbury Infantry Regiment, I Company, and died at Gallipoli in 1915, aged 22. A selection of photographs and postcards from the Heney family album. A selection of postcards from a postcard album containing New Zealand and overseas postcards, compiled by Ruth Crump. The diary, written by Henry Bottle, records the voyage of the Himalaya from London to Lyttelton, and starts on January 11, 1879, finishing on April 14, 200 miles short of the port of Lyttelton. One letter, undated, is written on part of the diary. The letters recount early experiences in Waimate and Oamaru. Diary of Charles Joseph Bridge, covering his outward voyage to Lyttelton on the Randolph and early life in Canterbury at the Homebrook run, near Lake Ellesmere, from 1850-1865. The diary includes various newspaper clippings and notes on family. Handwritten accounts and copies of letters recounting local and international trips and journeys mostly made in the 1870s, 1880s and 1890s by the Bridge and Griffin families. Local outings include trips to the Peninsula, Lake Ellesmere and Leeston, Hanmer Springs, Waimakariri Gorge Bridge, as well as Lake Ohau and Mount Cook. Journeys further afield include London, Melbourne and Brussels. A lively hand-written account of Christchurch events and personalities during the 1850s and 1860s. The text is interspersed with hundreds of cuttings from books and magazines. Many cuttings are portraits or caricatures, not always of the person described but regarded by Burke as having their characteristics. A small collection of letters and memorabilia from Frank (William Francis) Clarkson to his sister Margaret Clarkson (Garton), 1918. A letter written by Emerson Clarkson, Palestine, to his sister Lydia, 1917. Shipboard journal of Edward Eade, the Canterbury Association chaplain, who voyaged to Lyttelton from Gravesend on the ship Canterbury. Initially launched as a part of our Imprints collection. 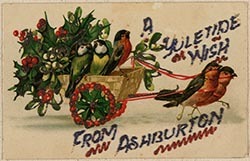 Two letters recording his experiences in the fires on the steamer Wairarapa near Gisborne and at the Albion Hotel in Invercargill, 1883 and 1888. The diary includes biographical information, a passenger list and information about the crew. The letters are written by Howard Kippenberger (Kip) to Glen and May Morgan. Joseph Munnings (1841-1923) worked as a farm labourer, carter, and storekeeper. Referring to his diaries as logbooks, he wrote about the weather, his work, leisure time and social activities. The diaries run from 1862-1866. The diary runs from 8 May 1862 to 30 May 1864. A brief diary written on board the Tintern Abbey en route from Gravesend to Christchurch, December 1874 - May 1875. One journal (1934-1935) is an exercise book relating the tramp to the headwaters of the Arawhata River (South Westland) and the climbing of Mount Ionia. The other journal (1930-1935) contains accounts of climbing in New Zealand, press clippings, a map and other inserts (1906-1951). A selection of material from the collection of Barry O'Sullivan relating to the first World War. The digital collection includes personal effects of enlisted men from Christchurch, regimental badges, diaries, letters, letterhead paper, newspapers, photographs and postcards. Unfinished diary written on board the West Australian, 12 March - 2 May 1864. The diary has song lyrics written at the front. Two letters from Robert Falcon Scott to the Town Clerk of Christchurch, thanking the city for various gifts to the Antarctic expeditions. Leather-bound diary of an early surveyor, Charles Reginald Shaw (1829-1906), in the Timaru district, giving working and domestic details, and including running accounts on the right-hand margin of each page. The diary entries run from December 1866 to August 1872. A handwritten diary January 17-February 28 1885 by Henry Smith, which documents the voyage of the Rimutaka to New Zealand. The collection includes a letter of reference dated 20 December 1884, an invoice for rates on land at View Hill, and a few family photographs. A collection of letters, diaries and photographs from Rewai Street, who served in the New Zealand forces in World War II. Shipboard diary of W. C. Walker; from Plymouth to Melbourne, 1 July to 30 August 1869. The memoirs of Thomas Watson, written for his family, in 1939 and 1940, of his early life. Thomas Watson’ parents and family moved to the Canterbury area, Brookside (known as South Selwyn in the 1860s), to farm, in 1864. George Whitley: Norfolk Island diary and other jottings, World War II, 1941-1943. Notebook diary written by George Whitley, N.Z.E. (Corps of Royal New Zealand Engineers), who was posted to Norfolk Island during World War II. His diary begins in September 1942 and ends in April 1943. The collection consists of 133 photographs, 128 of which are by North (1912-2008), and 5 by an unknown photographer. 79 of these photographs have been digitised. The Edge of the East project is s part of the Christchurch Documentary Project, a collaboration between Christchurch City Libraries and the University of Canterbury, School of Fine Arts to create a documentary photographic record of the seaside communities from Waimairi Beach to Southshore. Janneth Gil, Tegan Hollis-Ristow, and Rachel Pugh from the School of Fine Arts created a body of photographic images of people and the physical and social environment, a unique collection that reflects the diversity of the wider Brighton area in 2016. Images of people and places in the Halswell area from March to August 2015. The Halswell project is part of the Christchurch Documentary Project, collaboration between the University of Canterbury, School of Fine Arts and Christchurch City Libraries to create a photographic record of the wider Halswell area. Ellenor Waters, Nicholas Glen and Mitchell Bright from the School of Fine Arts created a body of photographic images of people and the physical and social environment, a unique collection that reflects the diversity of the wider Halswell area in 2015. A collection of photographs, slides and negatives taken by Norman Pierson (207815) in 1951 to 1952 during his time in Korea with 163 Battalion New Zealand Artillery, E Troop. Norman Pierson was the Gun Sergeant in charge of the No. 3 Gun. The photos were taken and sent home to his parents to show what he was up to in a strange country on the other side of the world . Photograph album compiled by L.S. Payne covering the construction of the Waitaki hydro-electric power plant; photographs taken between May 1929 and February 1933. Catalogue of the books belonging to the Canterbury Association packed in six cases for Lyttelton, 17 June 1852, and a bill of despatch signed by J.R. Godley for six cases, plus one case, dated 16 June 1852, mounted at back of the catalogue. Minute, committee and account books and papers from the Christchurch Young Men’s Literary Association collection. The Association began in 1864 as a debating society, and adjourned in 1867. The books and assets of the Association passed to the Christchurch Mechanics’ Institute. Photographs and hand drawn plans pulled from a report written by A.F. Stacey for the Christchurch City Council. The report documents inner city right-of-ways, and congested central city streets. A collection of material from the archives of the Linwood Public Library, a subscription suburban library established in 1909. Three addresses delivered by Robert Allan, Andrew Anderson and Arthur Dudley Dobson to Rotary Club members in 1922. The focus of the talks is early Christchurch and Canterbury and the development of the settlement in the nineteenth century. Includes foreword, and comments and questions from attendees. 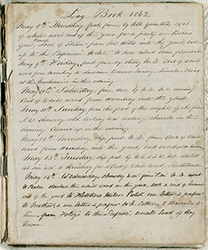 Minute book for the Society of Canterbury Colonists, a group established in London for the settlement of Canterbury, New Zealand. The minutes of the London meetings of the Society run from April 25th to August 15th 1850.